Don't forget Chili's Holidaily, a new deal everyday until Christmas! 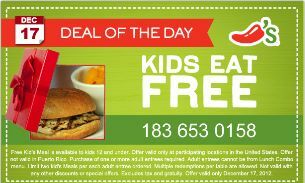 Today is Kids eat free at Chili's what a great freebie! A reason to take your child for a free meal. It is always fun to take the kids out for a fun experience. Shopping can be tiring it's always nice to take a break and get off your feet for a while. I love the family atmosphere at Chili's. I always get a booth it just seems more cozy and easier than chairs for the little ones to reach the table. I love the fact you have time to talk and visit differently because you are in an environment where you are focused on each others company rather than other things. Enjoy you time and have a great day all.